This entry is part 4 of 7 in the series South Tyrol. 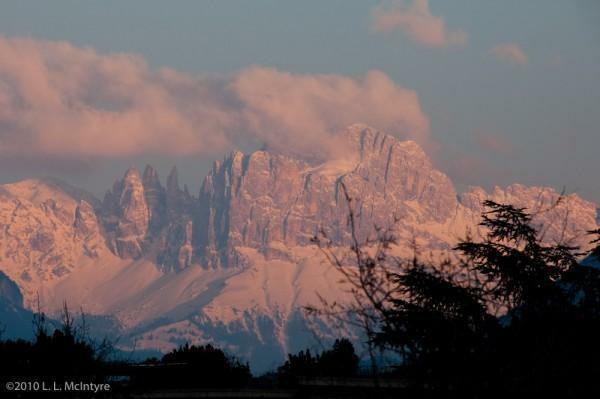 Alison’s recent posts about her trip to the South Tyrol region of Italy brought back memories of the three years my husband and I spent living in the South Tyrolean town of Bolzano (Bozen). 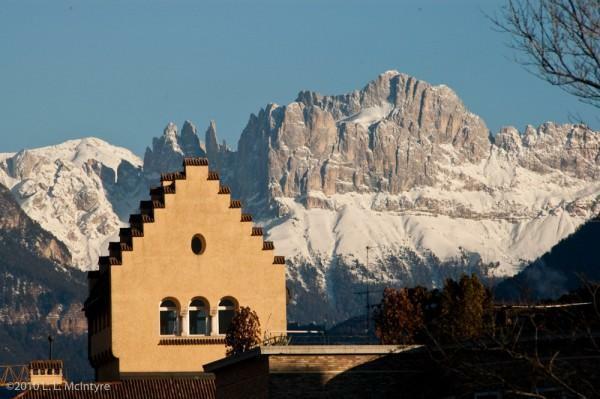 The stark Rosengarten peaks of the Dolomite mountains tower over this beautiful town. Although Bolzano is popular as a base for tourists who come to explore and hike in the area, people will often bypass the town and head straight to the cable cars that whisk you up to the trails in the mountains. But the town of Bolzano itself is worth some exploration, too, offering is an intriguing taste of Italy — but with a Tyrolean twist! For example, on the Via Museo (Museumstraße), a cobblestoned street lined with colorfully painted buildings in old city center, you’ll find the residence of the most famous resident in Bolzano: Ötzi, the world-renowned “Iceman” mummy. He’s located at the South Tyrol Museum of Archeology, which he’s called home since he was discovered buried in the ice on a hillside in the Alps in 1981. At the museum, you have the option to take a peek at Ötzi’s remains, but the real highlight for me is the comprehensive exhibit on Ötzi’s life. Ötzi lived in the Copper Age, 53 centuries ago, and the displays discuss the clothes he wore, the food he ate and the tools he used, along with the many ever-changing theories about how he died. Turn left out of the museum and head toward the Talvera Ponte (Talverabrücke), a long white bridge over the Talvera River. Take a right, just before the bridge, and follow the path into the park. A pleasant 30-40 minute stroll takes you through the park, with impressive views of both the Dolomites and the agricultural valley that surrounds Bolzano. 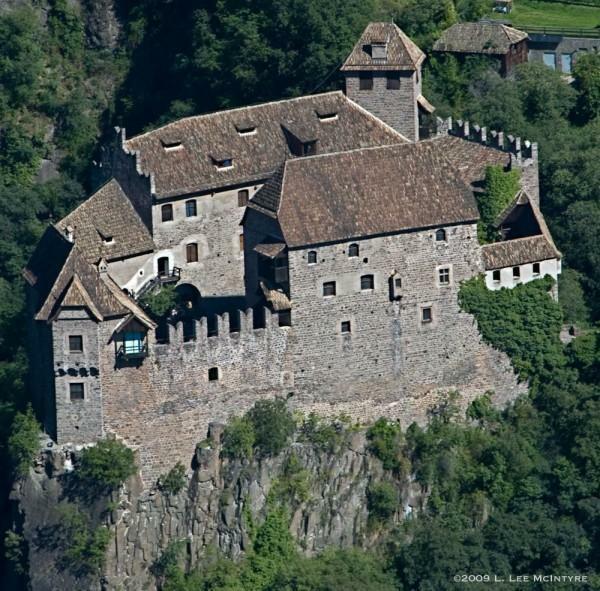 The path will take you to the base of a hill topped by the medieval Castel Roncolo (Schloss Runkelstein). (If you don’t feel like walking, there’s also a free 5-10 minute shuttle that periodically runs there from Piazza Walther (Waltherplatz) in downtown Bolzano.) A slightly steep path leads you from where the river path ends (and where the shuttle drops you off) up to the castle, which is now a museum. The twelfth century brothers who owned the castle were two rich merchants who wanted to live like nobles. Not only did they build themselves a castle, they also commissioned a series of frescoes to decorate the rooms. The “green” frescoes depicting the legend of Tristan and Isolde are in the “summer castle” rooms, and are well-worth the climb up that hill. Another reason to visit the castle is the restaurant that’s housed there. I was always amazed a museum would have a restaurant that serves up some great examples of South Tyrolean food specialties, including canederli, a Tyrolean version of a German Knödel (bread dumplings) and schlutzkrapfen (half-moon shaped ravioli), filled with spinach and ricotta. 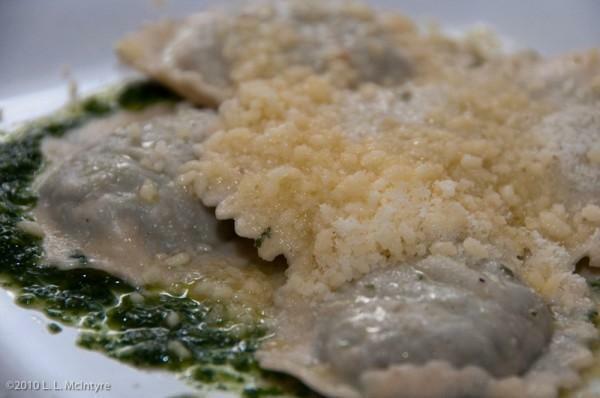 All of those are delicious when topped with melted butter and Parmesan cheese. The castle restaurant also offers a house-made apple strudel; strudel is a traditional local dessert, since the surrounding valley is the leading apple-growing region in Europe. Even though you could take the shuttle back to town, you might want to walk back instead, in order work up room for a snack when you get to Piazza Walther. As the biggest public square in Bolzano, Piazza Walther plays host to a variety of festivals, including the famous Christmas Markets (Mercatini di Natale/Christkindlmärkte) in December. If there’s a festival going on there, there’s bound to be a stall or two with treats to sample. 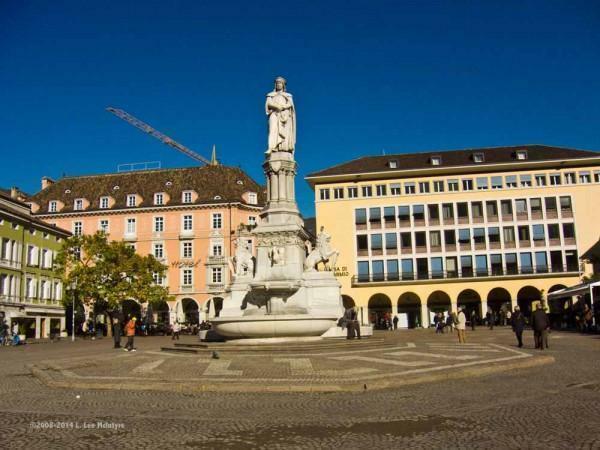 The square takes it name from the statue of 13th century Tyrolean troubadour Walther von der Vogelweide, who may or may not have been from Bolzano, but is claimed as a native son in any case. Back behind Walter’s statue, you’ll spot the pink-colored Hotel Città (Stadt Hotel). Grab a seat at one of their outdoor tables, order a beverage and enjoy the best plate of free snacks on the square, while you take in the vibrant action in this piazza. Or, at any of the places on the square, you might sample a scoop of gelato. With a gelato in your hand, as you gaze around the square at the green turrets that reveal the Austrian roots of this Italian town, you’ll get a real feel for the blend of cultures that marks life in Bolzano. 1. 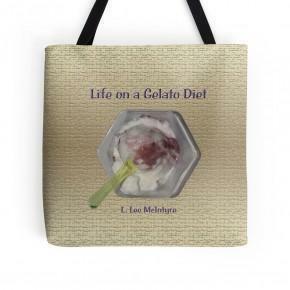 Go to Amazon and buy at least one copy of Life on a Gelato Diet, in any format. 2. Submit a copy of your receipt via email to contest@clfoto.net. Each copied purchased on the receipt represents 1 entry into the contest. 3. 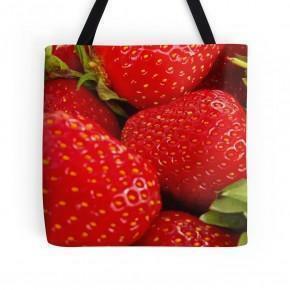 Bonus entry #1: Mention that you saw this contest on Cheeseweb and gain an extra entry! 4. Bonus entry #2: Post a review of the book on Amazon and gain yet another entry! One winner will be randomly selected from among all the entries on Tuesday, September 9, 2014. For more of her lovely photos and stories of expat life, be sure to check out Lee’s blog, Beyond the Gelato Diet. Lee McIntyre is an American photographer who went from spending summers as a child traveling up and down the Eastern United States to spending much of her adult life traveling around the world. At last count, she's lived in 5 different countries, and travelled and taken photographs in almost 30 more. Along the way, she's worked as a pianist, musical director, freelance journalist, visiting professor of Linguistics, ESL teacher, and software designer before turning to photography full time. Lee currently lives in Germany, where she writes books, takes photos, conducts photography workshops, and gives lectures on the history of American photography, when she's not busy trying to master doing all sorts of everyday expeditions in German. 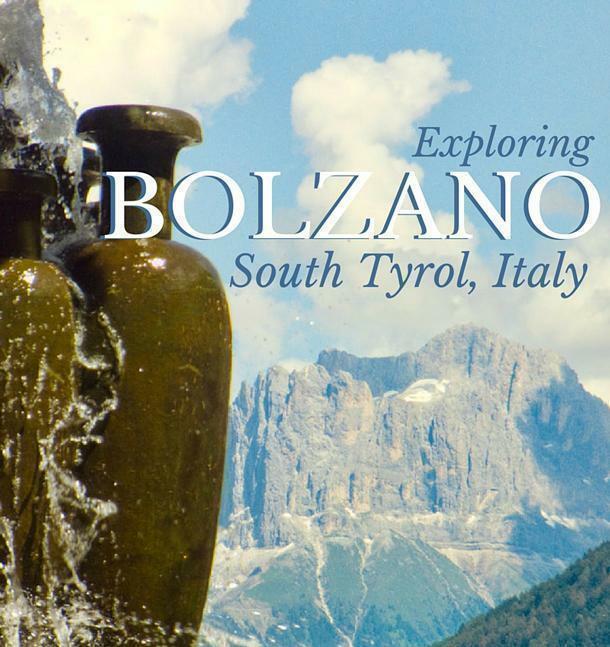 You are here: Home » Slow Travel » Italy » South Tyrol, Italy » Exploring Bolzano, South Tyrol, Italy and Reader Contest!